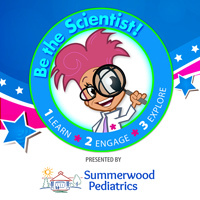 “Be the Scientist” Saturdays allow visitors to learn, engage, and explore the activities of a different type of scientist each month. Visitors receive an explorer card to track progress through the program’s three steps: Learn, Engage, Explore. Step 1 (Learn) features a tabling exercise teaching the basic principles of the monthly scientist’s discipline. Visitors move to a different location for Step 2 (Engage), which features a tabling exercise including hands-on interaction in an activity the scientist might undertake in real life. Finally, visitors encounter Step 3 (Explore), which is an exploration of a MOST exhibit relating to the work of the monthly scientist. Make your way through each step successfully and have your explorer card punched to mark your completion. Complete 12 sessions to earn your special mystery prize! All are welcome to participate! Most suitable for children ages 6 and up. NASA’s Hubble Space Telescope: New Views of the Universe is a 2,200 square-foot exhibit that immerses visitors in the magnificence and mystery of the Hubble mission and introduces the James Webb Space Telescope, which will be NASA’s premier observatory. The exhibit features a scale model of the Hubble Space Telescope as well as several “satellite” units that provide viewers with a hands-on experience with the same technology that allows Hubble to gaze at distant galaxies, and feature Hubble’s contributions to the exploration of planets, stars, galaxies and the universe.